While SYNLawn’s brand name has existed for commercial and residential applications for only the last decade, our family of artificial turf products have been manufactured and distributed under the AstroTurf® brand name to professional and collegiate organizations around the globe since 1965. The inventors of synthetic grass, AstroTurf® are one of the most iconic brands in sports — as legendary as the athletes who have battled on it. SYNLawn®, the brand that created the synthetic lawn category remains the leading innovator in artificial grass products for your commercial and residential applications. Imagine the punishment our synthetic turf fields take on any given game-day at any of the number of artificial grass baseball, football and athletic fields installed around the world. AstroTurf® continues to be the number one choice of playing field grass over the last 45 years as the brand is synonymous with it’s beauty, quality and ability to endure even the harshest punishment athletes can unleash. The SYNLawn® brand product line includes several different varieties of artificial grass styles for commercial and residential applications including landscaping, pet areas, play areas, and uncommon areas such as rooftops and patio decks. For the ultimate in realistic golf performance SYNLawn®, SYNLawnGOLF® and golf guru Dave Pelz have developed a total comprehensive line of professional grade golf turf. The SYNLawn® basix™ product line consists of more traditional, commodity grade artificial grass products used for tighter budgets, less demanding applications or contractor sales. The SYNLawn® brand through AstroTurf® comes with over 45 years of product development. With countless professional, commercial, and residential installations our synthetic grass products cover more than 160, 000, 000 square feet in sports venues alone. Your landscape, golf green, playground, rooftop, patio, or sports venue is guaranteed to last with the backing of the SYNLawn® and AstroTurf® names. How is SYNLawn artificial grass made? Ever wonder how SYNLawn artificial grass is made? Check out this exclusive, behind-the-scenes look at our manufacturing process filmed at our production facility located in Dalton, GA USA. 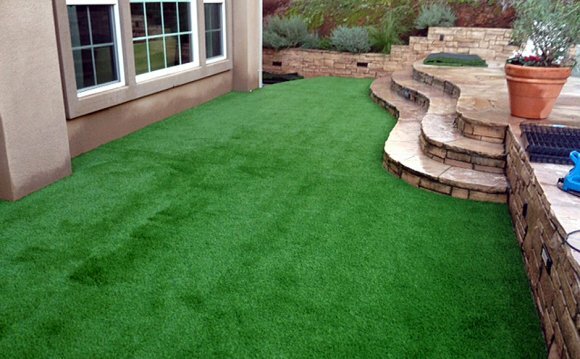 With over 40+ years of experience, we pride ourselves on offering only the best quality synthetic landscape turf products available.